Catie Cuan is a performer, choreographer, and technologist. She is a 2018 TED Resident, ThoughtWorks Arts Resident, and the Artist-in-Residence at the Robotics, Automation, and Dance Lab at the University of Illinois at Urbana-Champaign. She is currently pursuing her PhD in Mechanical Engineering at Stanford University. Here, she shares how her parallel passions of dance and technology have developed, as well as the different ways they intersect in her work. Can you share a bit about your dance history – what are some key moments, inspirations or accomplishments that have shaped you? I started dancing as a three year old at “Katie’s Dance Studio” (a different, spelled-with-a-“k”, Katie) near my childhood house in El Cerrito, California. My dance training was on-and-off, supplemented by gymnastics and volleyball, until I was 14, when I started taking dance classes at Berkeley High School. My teacher there, Linda Carr, taught modern and contemporary, and there was an audition-only class for juniors and seniors called “Dance Production.” I choreographed my first piece for a real audience when I was 15. I then danced all through college at UC Berkeley, taking classes from Peggy Hackney, Joe Goode, Amara Tabor-Smith and Lisa Wymore. I remember thinking how wonderful it would be to pursue a professional dance career, but everyone I knew at Berkeley was majoring in dance and something else. It was highly uncommon for people to dance professionally after college there. The summer after my senior year I spent at the American Dance Festival, thinking it would be my final dance adventure. While at ADF, several of the faculty told me to pursue dance outright. I moved to New York City that fall and started a full-time job in consulting. Being in New York was artistically invigorating and I met a number of young full-time artists who were hustling and starting careers. I decided to take a major leap and pursue dance as a real career. I became a work-study at Mark Morris Dance Center so I could take free dance classes and, during one of my first shifts there, Tanztheater Wuppertal was performing across the street at BAM. A friend called me from BAM to say he saw a woman selling a $50 ticket and I leapt at it. I wound up sitting in the 8th row with two Columbia University professors, talking about Pina Bausch. I was so inspired by the performance, I took a masterclass the next day with one of the Tanztheater Wuppertal dancers. He invited me to their company class the day after that and, within 48 hours of the show, I was taking ballet from Janet Panetta with the entire Wuppertal company in the upper level BAM studios. It was quite a New York moment. The first time I danced onstage at the Metropolitan Opera, I remember feeling this overwhelming sense of gratitude and warmth. It is truly divine to dream as a child and then realize that vision as an adult. I also will never forget my first audition in New York. It was for Gallim Dance, and the room was filled with original, transcendent dancers. I was so inspired by them it took me awhile to recall the combination! Can you share about your interest in technology? Again, what are some key moments or accomplishments that have shaped you? Megan Smith refers to my generation as “digital natives,” a generation that doesn’t have many memories before personal computers. I got my first personal computer when I was 9 years old. I grew up in the San Francisco Bay Area in the 90s, so the tech boom was tangible, and my family noticed how quickly the region started to change. I was first intrigued by the tech industry when I read a 2008 New York Times article about cell phone usage in developing countries. In Bangladesh, Grameen Bank founder Mohammed Yunus sold cell phone kits to individual women who setup businesses as phone operators. I realized how mass-scale technology like cell phones and satellites could allow people to leapfrog intermittent technological developments and make real change in their lives. I interned at Google twice in college where I worked with teams at YouTube and Google Ads. How did you get the idea to combine dance with technology? A few months after I started dancing in New York, I decided to find a part-time job where I could keep honing my digital skillset in addition to performing. I became vice president at Color + Information, a digital creative agency in Greenpoint, Brooklyn, where I got to work on websites, mobile apps and digital strategy. Sometime after that, I was working on various projects with different clients while performing and choreographing in the city. It was invigorating but I felt like I lived in two different worlds. I sought ways to combine my passions for dance and technology and became connected to people like Sydney Skybetter, a choreographer, academic and writer who had embraced both. I started exploring using virtual reality and video in performance and attended the Conference for Research on Choreographic Interfaces (CRCI) at Brown University, where Sydney is a lecturer. At CRCI, I met Amy LaViers, the director of the Robotics, Automation, and Dance Lab at the University of Illinois at Urbana-Champaign. She invited me to be the artist-in-residence at the RAD Lab and it was a significant opportunity to combine my interests in dance and technology. In particular, you’ve been exploring how robotics can fit into choreography. Can you share a bit about your recent projects? My long-term project with the RAD Lab is called Time to Compile. It is a narrative stage performance, an art installation, and a body of human-robot interaction research. Some of our publications can be found here, here, and here. The piece explores themes of “are humans becoming more robotic?”, “how long does it take for different processes to compile?”, and “the hidden human network that drives all technology.” I started Time to Compile in June 2017 while in residence at the RAD Lab, and it has been performed at Joe’s Pub in New York, ParadigmShift in Toronto, CODAME in San Francisco, the Ferst Center for the Arts in Atlanta, and several other cities from Genoa to Urbana-Champaign. My second project, OUTPUT, started during my artistic residency at ThoughtWorks, a global software consultancy in New York. OUTPUT is a grouping of custom software and a live performance piece. 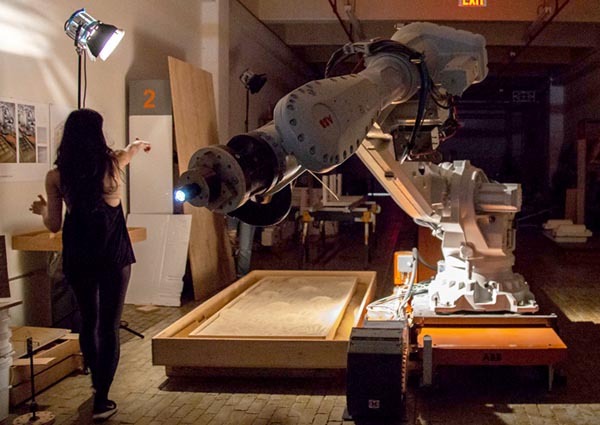 OUTPUT is a collaboration with ThoughtWorks developers and the Consortium for Research and Robotics at the Brooklyn Navy Yard, a Pratt-affiliated institution. A blog post with more information about the technical execution of the project can be found here. It explores themes of movement representation across various bodies. What are some of the biggest limits in robotics that you’ve come up against? Robots are finite. They are similar to other digital systems like phones; they only do what they’ve been preprogrammed to do, and they have a finite set of outputs. A phone will not spontaneously start flying across the room unless it has been thrown. Shoes will not untie themselves unless there’s an automatic untying mechanism built in. Robots are the same. I think robots’ capabilities have been overblown in society and it is dangerous to continue reinforcing that narrative. There are many current challenges in robotics – how humans will interact with them, robot ethics, power sources, multi-plane mobility, and robots in swarms. It is a rapidly expanding field! 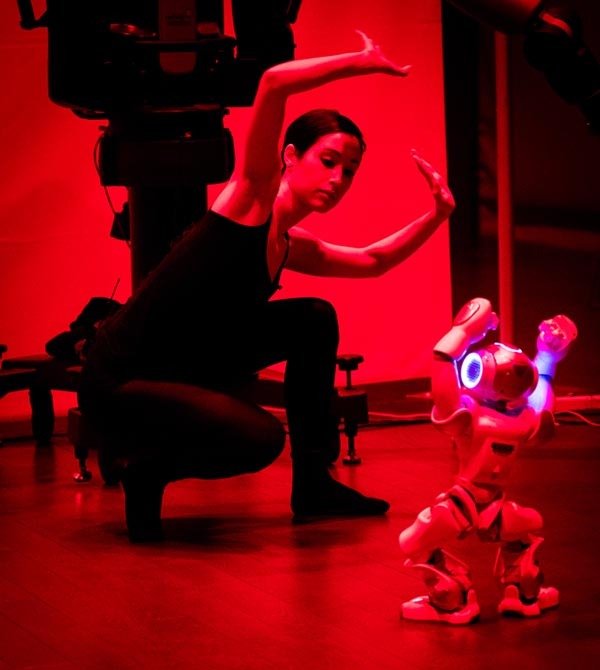 How can robotics inform choreography in ways one might not expect? 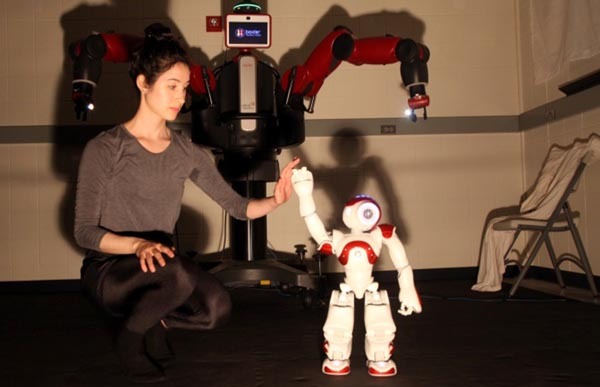 Robots are tools which can be dance partners as well as affective entities in dance performance. One might not expect to feel such emotional connection to robots in performance, and those connections can reveal more about human sentiment than they will about robots. Shakespeare in Hamlet and Ken Goldberg (of UC Berkeley) have a similar quotation about how theater and robots hold a mirror up to nature to reveal uniquenesses in human psyche. 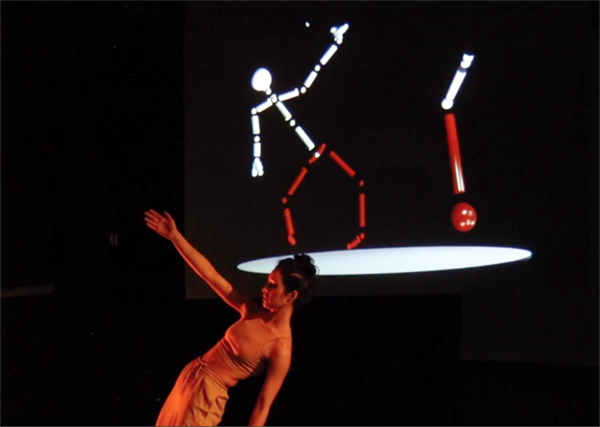 Conversely, how might dance and choreography inform robotics in ways one might not expect? Choreographers are experts at creating movement which creates meaning. Robots will convey meaning in society based on their movement actions. The translation in expertise is critical. Roboticists work with animators, psychologists and writers to make robots more effective and acceptable in society, and conversely choreographers provide unparalleled movement expertise. Choreographers also work with context – lighting, space, other humans and other objects to create a holistic scene where movement illuminates relationships. Robots in human-facing environments will need to work within various complex contexts as well. One simple example is the motion of a hand. In ballet, the thumb is slightly tucked during second position in order to create more length across the arm and to activate muscles below. It also creates a relaxed, majestic shape like one of grazing your hand across a still pond. Even this simple shape says much about the state a person may be in when making it. How will we know a state that a robot is trying to convey when it does not have hands or perhaps even a humanoid shape? In your experience, how would you characterize the dance scene’s relationship to technology? Do you find a lot of interest or pushback? There is certainly a place for technology in dance and vice versa. One question I get often is, “But why?” I think it’s important for choreographers and performing artists to work with technology because it is a contemporary tool which can illuminate new things about human motion. The data of the body has never been more readable. We don’t just have videos now; we have depth sensors and motion capture systems to record and analyze bodies moving in space. You’re currently working on a PhD in mechanical engineering at Stanford – how do you hope to use your higher education to further develop your work? Yes, I am working on a PhD at Stanford in the Mechanical Engineering department. I also take dance classes in Theater, Arts and Performance Studies. I decided to pursue this degree because my artistic practice and my research practice were becoming increasingly intertwined. They are based in having an inquiry, creating a context with which to probe that inquiry, presenting that work to audiences/experiment participants, and deriving real-world conclusions or ideas based on what you find. The next piece for me is having the personal tools to build and create with software and hardware the same way I have human motion tools like choreography and performance. I’d like to design an interface to teleoperate robots using gesture. I’d like to create a series of movement measures which work across all human-robot interaction studies. I’d like to keep making performances where robots are utilized and studied. I’m not sure what the outcome will be – that’s part of the inspiring ambiguity that comes with research and art-making! To learn more, visit catiecuan.com.